Entries will be accepted between January 14, 2019 – midnight CST on February 28, 2019. Judging will occur in April, 2019. The honoree will be notified in May, 2019. The Morley Safer Award presentation will be held at a lunch in New York City in the fall of 2019. The Morley Safer Award for Outstanding Reporting, including a cash prize of $5,000, will be bestowed on a reporter of creativity, vision, and integrity at a lunch held in New York City. Travel and hotel expenses for the honoree will be provided. Recipients of the Morley Safer Award will be invited to share their professional experiences with students at The University of Texas at Austin’s School of Journalism. The Morley Safer Award seeks stories that embody Morley Safer’s commitment to original reporting grounded in historical context and informed perspective. Open to United States or Canadian news media: print, broadcast, radio or digital. Published, broadcast or posted between January 1, and December 31, of 2018. 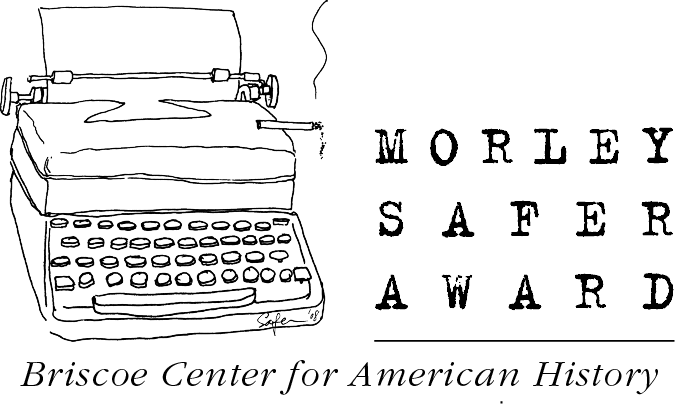 Candidates for the Morley Safer Award may submit their work directly online via the submission portal located on this webpage beginning January 14, 2019, through midnight CST on February 28, 2019. Candidates may also be suggested by a member of the Morley Safer Award Panel of Nominators composed of journalists from multiple news platforms. Nominees will be contacted by Morley Safer Award staff to complete their submission. If the story involved continuing coverage, applicants may submit one file comprised of extensive excerpts, which best represent the evolution of the story. A brief statement describing how your story meets the selection criteria. An entrance fee of $100, payable via major credit card in the submission system. Your statement, media materials, and entry fees are all submitted online through the Morley Safer Award submission system (available on this page on January 14, 2019). Media files must be uploaded directly to the submission portal for consideration. Please submit written materials in 12-point Times New Roman or similar font. Individual files up to 25 MB each will be accepted. Please be aware that it may take some time for the file to upload, especially if you are on an internet connection with limited bandwidth such as public wifi. Files must be uploaded individually. Your application can only be open in one location; opening it in other locations to add additional files will cause only one instance to save, leading to errors and loss of work. Zipped files and Watermark files are not accepted. Producing individuals and network/platform companies should consult each other prior to submission to avoid duplicating entries. Duplicate entries will be considered once. There will be no refund of fees.